The time has absolutely flown by since my return from Haiti. I didn’t realize it until this past Thursday when I had an opportunity to speak with the children of the orphanage via facetime. I was originally scheduled to write about Day 5 on my Haiti experience; however, I have had a change of heart. Honestly, I think my entire trip can be captured in this 10 minute video that is below. I encourage you to watch it and take it all in and form your own thoughts and opinions. This was truly a LIFE CHANGING milestone. There are opportunities all around us each and every day. It is one thing to say it, however, it is another to acknowledge it and act on it. I challenge you, if you are reading, to find out what opportunities are around you that you simply haven’t chosen to act on. Go forward and take the leap of faith. You have the opportunity to do something great. Now, look at yourself in the mirror and get at it. Make today count! I would like to once again thank all those who have supported me through prayer and financial support. I am forever grateful. Finally, I ask that you continue to pray for these beautiful children. Good morning and Happy Monday once again to you. This might be your first time visiting this blog. If so, welcome to Day 3 of my journey to Haiti. We have all been given great gifts to do incredible things. I hope that you use your skillset this week and change the world. Enjoy the read. The next post will be on October 19th. The team has shut it down for the night and the kids are guaranteed to being sleeping hard. It is just me and thoughts, emotions, and questions more so than answers are racing through my head. The day took off with a bang and a similar start to that of prior day. Moving forward, a quick Bible study bright and early in the morning, diving into the word, prayer, breakfast, and we were off. 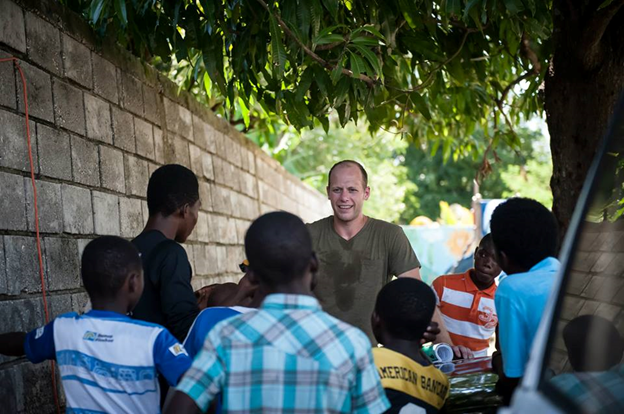 Weeks back, I had the encouragement from a team member to teach the Bible while in Haiti. The guidelines of this commitment was to prepare a study for the young boys in the orphanage and pull 5 male figure from the Bible and teach the children of the orphanage the character traits of these men from the Bible. What does it look like to be a man of God? What does it look like to walk with God? What does it look like to pray? Etc. I was extremely excited to get into the classroom but oddly enough very nervous the closer and closer the time came. I can’t figure out if it is a perfectionist thing or if it is fear of failure. Was it fear of judgement? Was it the language barrier? I really don’t know. Regardless, I had the opportunity to teach on Nehemiah today to kids ages 5-12. As I sat and prepared, I had no idea what to expect but God does work in mysterious ways and yet again I had the chance to witness it. As I waited for the one classroom that the orphanage has to open its’ doors, I had the chance to sit and visit with one of the high school boys about the orphanage and his experience. He was an incredible shot and jolt of energy for me personally today and sure to be throughout this trip. He spoke English fairly fluently and shared everything with me, uncensored. The most impacting question that I heard on earlier in the trip was a simple one and one that I felt compelled to ask him. “What makes you happy?” On the snap of a finger, his answer was “the kids”. Wow! You want to see brotherhood at its finest, I suggest visiting this orphanage. I asked this young man to share some life goals with me as we got to know one another. Like many children of the orphanage that I spoke with, he wants to be a doctor but needed the proper education and understands that. I went on to ask him deeper questions surrounding education. Have you studied English? Have you been outside of Haiti? Do you intend to visit a U.S. school? If not, would you ever if given the opportunity? He sat and took question by question from me and fielded each one with a smile ear to ear. Now, I am not foolish enough to think that I can change the situation that each child is currently in at the orphanage on the snap of a finger. I know that I couldn’t get this young man a passport, air fare, and permission to leave to the U.S. when asking him these questions and listening to his answers. Conversely, I did recognize this intelligently young man God put in my path that was thirsty for more and capable for more. Why not use this moment? The doors to the classroom opened up and the kids filed in one by one to learn the lesson for the day. I was scared, filled with anxiety, and hesitant to go in for the reasons I mentioned above but it was lifted quickly. It was that “game time” feeling where my trigger in my heads said “let’s go” but I was missing a piece of equipment. I have no idea why but I turned to this young man (17 years old or so) and asked him how serious he was about learning. His smile was still radiant and beaming. He once again expressed his thirst for more. I looked him in the eye and said I am about teach and need another man to teach this lesson. There is no one better in this place and this moment than you to help me interpret and these boys look up to you. “Are you in?” His response was lacking the confidence I just witnessed for the previous 15 minutes but still he answered with a, “yes”. He did outstanding! He stood next to me in front of the room and spoke confidently translating as much as he possibly could. He overcame fears and some struggles and I would hope that this was a huge lesson for him and his courage for future endeavors. The reason that I am writing this isn’t because of the teaching that took place in the classroom during the designated time however. It was because of the teaching that took place outside the classroom for me and this young man. I get so consumed by what is coming that I have no control over and can’t believe how many chances or opportunities that I miss like this one because of it. Did I need to come to Haiti to recognize this? After the class, I went to the market in the deaf school also found on the grounds of the orphanage. I think my experience could be summed up as overwhelming, intimidating, and mildly annoying with the constant pulling and yanking. Everything in my heart wanted to purchase everything for sale. Everything in my head knew that this wasn’t possible. IF you have ever been to the market in Mexico, you can multiply this by 10 with physical contact on top of it. On the bright side, it did bring joy to my heart to see all those part of the orphanage working to make money and committing to hard work. I had an awesome opportunity afterwards to sit with two young girls and another team member where we proceeded to learn sign in efforts to better communicate throughout the mission trip. I was absolutely floored with the patience, love and support that these two orphan children shared with me as I fumbled through their books with words and sign. We literally passed a book back and forth while writing notes in the sand and on the concrete as a means of communication. Anything is possible with patience, love and support and this miniature act was further proof. The day proceeded with more life changing events but the night quickly fell on us. I really don’t know how to sum up the fun other than saying we danced. We danced on the porch of the young boys living area. We danced on the gravel. We danced on the basketball court. We literally danced everywhere. I saw one cell phone playing the tunes, a group of caring adults and kids everywhere moving and grooving. I stepped out of the fun and the memory making moments just to watch for a minute and take it all in. One word to sum it up, comparable. These kids partaking in the dancing, singing, basketball, etc. that were taking place all around me were no different than those back home. I watched the flirting, the competitive natures flowing, the shyness, and the “changes” that come with different age groups. Overall, the day was a blast from start to finish with relationships forming and memories continuing to be made. I can’t wait until tomorrow to see where this night of energy and excitement take us. Good morning and Happy Monday once again to you. This might be your first time visiting this blog. If so, welcome to Day 2 of my journey to Haiti. Please circle back and read lasts week blog post if time permits and you haven’t already. Before you move forward, I would once again like to issue a warning to all readers. These writings are from my own lens and my own opinions. The writings to come are most likely not grammatically correct. The punctuation is average at best. I encourage English majors to put the pen cap back on your red pens because the sentence structure is at a minimum. The warning is put out there to all readers because I went ‘old school’. Yes, I wrote all of my words on paper with an ink pen. This might sound foreign depending your generational make-up, but it really does work when you want to tune into your experience and tune out all the distractions that come with every screen (t.v., phone, computer, ipad, etc.) we engage in on a daily basis. The last statement that I will make is that I hope you enjoy reading these experiences. As I have said to many, every activity had a story; therefore, I encourage you to call me, email me, text me, have dinner with me or connect with me if you desire through whatever other form of communication I may be missing. I would love to share with you every moment and scale down the 50,000 foot view into the gritty reality. Day 2 in Haiti took off bright and early after a below average night of sleep. I have always been thankful for any and all hospitality that I have received throughout my life. My night of rest is enough to make me think about just the recent hospitality that I have received. A few weeks ago, Carly (my wife) and Rylee had the opportunity to visit my extended family in Chicago for a wedding. My Aunt and Uncle who put us up for the weekend have an incredibly beautiful home that is located in a pristine neighborhood where safety sets in from the first turn in off the main road. Today, I woke up thankful to be on a bunkbed that was off the dirt floor and elevated from a majority of the bugs that roam the rooms. Sure, the metal bars were poking through the mattress into my back but again it was a bed which is more than many in this country has. Anyway, I woke up before the rest of the team and took the time to witness the sun rise through the mountains. As the sun climbed the mountains and peeked its face that ‘wow’ feeling you get when nothing comes out poured into my head and was absent from my mouth. Now, I speak of the mountains because at ground level I can’t say that I saw the same beauty. I went for a run in the orphanage and all I can say is that “wow, we are spoiled back home”. I am certain this is going to be an ongoing message as I self-reflect daily. There aren’t nicely poured sidewalks, any nice bike trails, and no treadmills. Those amenities that were at my feet 48 hours ago have been traded in for rocks, potholes, more rocks, and a giant hill with roaming goats, chickens, and a unique aroma that will take time to adjust too. I don’t run because it feels good or because I like it. In fact, the only reason I ever lace up the shoes is to release pent up energy and clear my mind. Like any workout, thoughts often race through my head and I get lost in the ‘things’ that either happened or are in front of me today. The same can’t be said today with this workout. I was focused, and I had to be. To the left of me were goats and roosters startled with every foot step I took. To the right were stray dogs that could be better compared to oversized malnourished cats pacing back and for like my shadow. At the top of the hill was a man on duty and protecting the property with a loaded gun. One thought ran through my head…”head down; heels up”. I share these ‘things’ around me so you can get somewhat of a picture in my head. As I took off on my run back and forth I eventually got lost in thought. As I finally released my worries of family, work, and the life back home, I quickly realized how baffled I was by the agriculture around me. In fact, I quickly started to compare everything around me. Now, agriculture has always intrigued me. In fact, I always wanted to be a farmer. There is a little fun fact that only a few know about me. Fast forward 30+ years, I can confidently say I am the farthest thing from a farmer. In fact, the only thing I have going for me is that I married a farmer’s daughter. So, I’ll take a little bit different of an angle in my writing. Carly grew up with this lifestyle all around herJHer Grandpa Pete lived and breaded it. Her dad, uncles, cousins, and friends did or are doing it, and my brother n’ law lives for it. These men and their families could do a better job drawing comparisons but all I could think about on this entire run as I got lost in my thoughts was Matt who is my brother n’ law. I mentioned that he lives for it and I truly believe it. He gets me more and more intrigued with the entire operation every time I hear him speak. He has a gift that God has given him. It is his life. He knows the trade, breathes it, lives it, and excels in it. (Jena, I know Matt isn’t reading this so please let him know that I am pumping his tires for him.) Remember, I am not a farmer nor do I pretend to know the first thing about it. I watch it, read about it, and listen when I have the opportunity to learn about it but again really know nothing. In that breath, I do know enough to know Haiti isn’t the ‘land of plenty’. The goats that are grazing don’t have the rich crop that we see in the Midwest. The land is littered with pollution and the look of the animal resembles these shortcomings. The goats being eaten at supper here is far from the meat produced on the table back home. The graciousness and thankfulness for the land, the farmers, and nutrition back home has never been so appreciated. My run was done, breakfast was eaten and it was time for church. If you want to know what worship is then visit Haiti. It was absolutely incredible! Back home, I grew up like many going to church every Sunday and like many families including my own today we always have the ‘Sunday morning rush’. It only make sense to rush everything right? I mean this is afterall “the day of rest”. This means that you can sleep in a littler long because you work so hard the previous six days. Right? (Sarcasm) In turn, this extra 30 minutes of sleep leads to kids, breakfast and everything else beind delayed. You look at the clock and realize there is only 18 minutes before service and you still have two kids to get ready. One is wearing his his eggs and toast with a wet diaper while the other has bed head and won’t start getting ready until you have answered every question a minimum of four times. Plus, you have to get yourself put together all before your wife explodes in frustration because she is tired of ‘Ground Hogs Day’ taking place every single Sunday. Okay, just my house? Bringing it back in, Haiti doesn’t work this way. Why? Well, I quickly found out that there aren’t any clocks in Haiti. I now know what Haiti time really means. Service was set to start at 9:00 a.m. Well, 9:00 a.m. came and went into 9:15, 9:20, 9:30 and people still tricking in. No worries man as they were telling me in Jamaica a few months ago for Dave and Kate’s wedding. Just worship! I didn’t know one word that was being sung or preached and yet my eyes filled with tears. Here God has placed me with a little boy who took my hand and walked me into service and right in the middle of the congregation listening to people rejoicing. The scene of these children and adults enthralled in worship was something I will never forget. After hours of chuch, it was play time. There were no plans for our team or the kids which was great. I came to engage and this was the time to do it. There was a village boy sitting near the exit of the orphanage that caught my attention. As I walked his way, we commnicatied although broken. He explained to me that he was a villager who took a taxi to the orphanage. He came to make money and sell bracelets. Cool right? The next few hours he hung around me and as I was watched him I noticed how the orphans looked to him in somewhat of a mentorship role. He served as a big brother that protected them but didn’t overstep any boundaries. After some questions from me, he started to share with me some of his life outside the orphan walls. He had recently built a home. I was stunned and impressed. The where, what, how questions started to roll off of my tongue especially because of the little materials and poverty I saw the day before on my travel into the orphanage. This young man, 18-21, shared with me that his house was built of 225 cement blocks comparable to the cinder blocks we have back in the U.S. He showed me the work he had done and also shared with me all the work he does to make money. The list was a hodge podge of things ranging from making bracelets to building huts. This was a reality check for me. Honestly, who was getting the life lessons here? How great do I really have it back home? We loaded up the tap-tap and packed it tight. Cheers, smiles, jubilation were all around me. Then the view as I looked out the back was pure depression and let down outside that bus. The deflated hearts and heads hanging resembled someone who just got punched in the gut. Well, I looked to my side and saw this 10 year old on my hip pocket. He was sharing with me everything in the city as we were driving by proud of where he was from and anxious to show me the next big thing. And then, we pulled up to an open field. It was 43 acres and man-made irrigation. The kids poured off the tap-tap and screaming with excitement took off running. The boys were asking me how to skips rocks while the girls were daring me to jump in. You want perspective? I’ll take you back to my family, the farmers. They farm acres upon acres upon acres. Here, 43 acres provided these kids will freedom and chance even if it was for a short amount of time before going back to the orphanage. I stepped back and it was honestly a clip from a movie scene watching these kids running with free spirits. I will never forget the sounds of the laughter and the visual of kids seeing the water and skipping rocks. This ‘still-frame’ moment will never be forgotten. I look forward to you having an incredible week and seeing you back on this website next Monday, October 12th.